Jo makes hearty and wholesome meals that are filling and nutritious – no fancy “nouveau cuisine” here! Why not try Jo’s “special” cottage pie? A triple layered treat. A base of mashed carrot and sweet potato, middle of mince (beef or vegetarian), lentils, beans and rich sauce topped with mustard mashed potato and parsnip. Layers of beef or vegetarian mince, pesto and lasagne sheets, topped with cheesy béchamel sauce. Try either beef or vegetarian mince chilli. 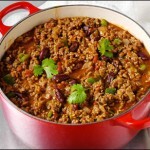 Or Jo’s slow cooked choc chip chilli. Chunks of beef, chorizo, chilli and red wine make this a rich, filling meal. Chicken and butter bean thai green curry. Slow cooked chicken thighs, butter beans and green beans in a coconut and thai green curry sauce. Mild or medium. A selection of vegetables in a medium heat curry sauce. Chunks of beef, mushrooms, chestnuts and onion cooked in an ale and juniper sauce. Perfect with mustard mash. Chunks of white fish, smoked fish, prawns and hard boiled eggs in a béchamel sauce topped with buttery mash potato.